Are you an activation, DOOH, event or creative Agency? Outsource the development to interactive software experts. Deliver the most stunning interaction & activation scenarios. Technology offers new ways to interact with customers. Social media, mobile solutions, motion sensing, multi touch technologies, kinetic games, advanced augmented reality scenarios and other activation points are far more compelling than traditional tools. With Aduma on your side you can now focus on building a strategy and creative scenario, while we will make sure that the software works exactly as you planned. Our specialists verify the scenario with you, provide a feasibility opinion and cost projection. During the execution phase you deliver the designs (or if you want we take care of that too) and based on the graphical elements our team produces the software and offers technical guidance to implement the solutions. If you need technical partners on the ground – we will direct you to one of our certified integrators in your region. Check the technological feasibility and cost of putting together your vision. Deliver even the most advanced ideas and creative concepts of your team and customers. Gain access to our integrated interactive platform with limitless possibilities. Outpace the competition: Our know-how and vast experience enable us to deliver solutions in tight deadlines. Be assured that everything works as planned: we have delivered over 1000 solutions globally! Streamline your costs – our Poland-based programmers offer best quality at competitive rates. 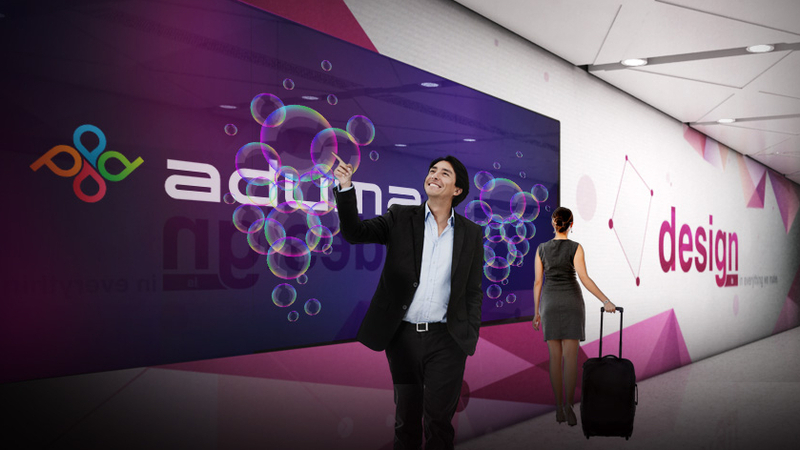 Improve communication – Aduma works with the most demanding agencies. We speak your language. The next big thing in touch software for corporate meeting rooms, education, retail and more. Try it now and see how this affects your touch screen business. Interactive wall for Grupa Żywiec breweriers presenting the history of the brand and activating the visitors. A multi touch kiosk for AdiZero campaign powered by engaging Aduma software. A 103" multi touch retail solution attracting customers and empowering the brand. World's largest kinetic VideoWall located in Wrocław, Poland. An Orlen Marathon kinetic game for Złote Tarasy shopping mall. Application developed by Aduma. Refreshing shopping experience with Aduma mobile app for malls. Pick a theme, make a photo, and post it! Get in touch now! We will call you back. © 2014 Copyrights Aduma S.A.